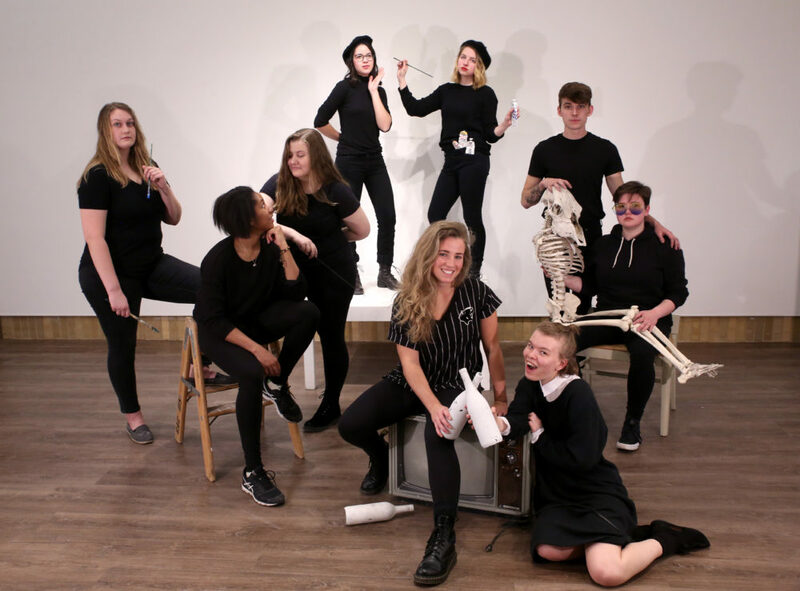 Senior art majors who contributed to "Adieu: Senior Studio Art Majors Exhibition 2018" pose for a photo. The exhibit's opening reception will be 4-6 p.m. Saturday, May 5 in the Hillstrom Museum of Art. Honors Weekend is busy on campus, so here’s a handy guide to all of the fabulous fine arts events on tap! From art to jazz to bluegrass, there’s something for everyone, we hope you can join us. Come for an evening of jazz featuring Gustavus Vocal Jazz and Jazz Combos, directed by Masa Ishikawa and Don Norton. The concert features some of our award-winning students fresh off their performances at the Eau Claire Jazz Festival. Works include pieces written and arranged by Masa Ishikawa, as well as Herbie Hancock, and students Alex Preston and Andy DeLuca. This event will be livestreamed. The Senior Honors Recital features several of the most talented seniors musicians at Gustavus from a variety of different majors. This year’s honorees are Ryan O’Neil (bassoon), Kaitlyn Peroutka (soprano), Olivia Niles (piano), Kelly Neubauer (clarinet), Jessica Backes (flute), and Christian Gustafson (baritone). The 2018 Music for Peace Composition Prize will also be awarded during this recital. This event will be livestreamed. The annual senior art majors exhibition features the work of Georgia Bebler, Sara Blinn, Jenna Hansen, Lauren Ihle, Carly Maslowski, August Henry Moehrke, Rita Morgan, Caitlyn Riese, and Jane Skodje. Extended hours for the museum beginning at 10 a.m. gives the public a chance to see the capstone works of these graduating seniors. An opening reception will be held from 4-6 p.m. All are welcome. The Gustavus Choir, Choir of Christ Chapel, and Lucia Singers perform in the annual Choral Showcase at 7:30 p.m. on Saturday, May 5 in Christ Chapel. The performance features folk songs and spirituals, as well as works by contemporary composers Ola Gjeilo, Eric Whitacre and Dan Forrest. Student conductors Kaitlyn Peroutka, Duncan Matthew, and Michael McKenzie will also be featured on the program. The centerpiece of the performance will be the The World Beloved: A Bluegrass Mass, a piece that features special guests, the No Tent Bluegrass Band. This event will be livestreamed. The Gustavus Philharmonic Orchestra, conducted by Justin Knoepfel, delivers its final concert of the year performing American folksongs, Telemann’s Concerto for Viola and Orchestra in G Major (performed by Knoepfel), and Britten’s Simple Symphony for String Orchestra. This concert is free and open to the public. It will also be livestreamed.